Engagement of 2512 Teachers (Primary) and Teachers (Primary-Urdu) in the schools of MCD on contract basis. 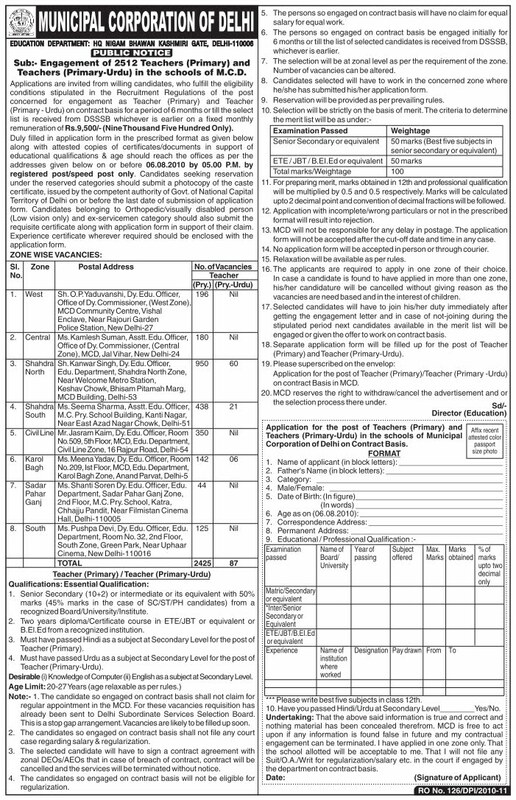 Applications are invited from desirous candidates, who fulfill the eligibility conditions of the post concerned, for engement as Teachers on contract basis for a short period upto 06/08/2010 or till the select list is received from DSSSB whichever is earlier, on a fixed monthly remuneration of Rs.9500/-. Duly filled in application form in the prescribed format alongwith attested copies of certificates and documents in support of educational qualifications & age should reach the office of Deputy Education Officer in the various Zonal Offices on or before 06/08/2010 by 5.00 PM through registered post/speed post only. For more information and application form, please visit http://www.mcdonline.gov.in/ . OR click on the image to view/ download the details.